Listening behavior is pivotal to how we navigate and succeed to our own satisfaction in life. Here we take a brief look at the various types of listening that constitutes one half of communication. Whilst each type is is closely related to the fundamentals of listening, and to each other, they all serve different purposes. Communicating is difficult because most Humans share a common habit of interpreting the world from their own viewpoint. This is not unreasonable considering the tremendous influence one’s upbringing and environment has on molding that viewpoint. In addition, most societies insist it’s members conform to the status quo rather than intelligently question a given state of affairs and seek truth. These three influences can act as deterrents to genuine communication. Blindly maintaining barriers that prevent Harmony and progress between individuals. In particular making changing one’s mind an onerous task that can take quite some effort. And courage. However, there is much help at hand to enable each of us to improve our listening skills and become progressive Humans in our own right. Comprehending and mastering the different types of listening is a major step in the direction of personal, and wider progress. Familiarity with each type of listening allows one to approach any Human interaction with - at least some – confidence. And expectation of an amicable verbal exchange. Listening, and communication, is far from a cut and dried process. It is messy, sloppy, and mostly imprecise. It is of little comfort to realize that - almost without exception – we Humans knowingly suffer, and yet accept, the malady of poor communication. Nonetheless, If we consistently practice getting it right during one on ones – by far the most important situation – it will eventually flow onto getting it right in a group of three or more. 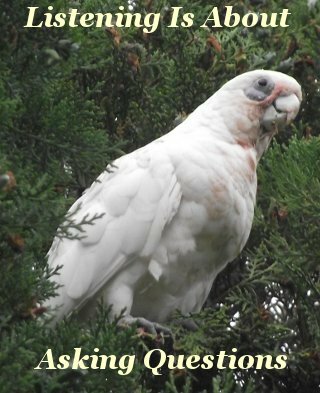 Contrary to popular perception, listening is all about asking questions. The right questions. Questions about the subject under discussion and that lead to elucidation and mutual understanding. Anything less is not communication. It takes two willing people – as in willing cooperation - to communicate effectively. 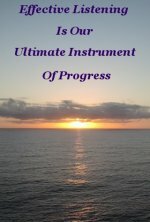 The process is initiated by you, and me, the individual. If we are prepared to listen, consistently, no matter how long it may take, eventually the compliment will be returned. There will be a meeting of minds as the aha moment explodes in vivid clarity, and the euphoric sensation of knowing we have been understood, never quite leaves us. The various types of listening are our launching pad and stepping stones. They are tools and aids on our never ending quest to understand our fellows. 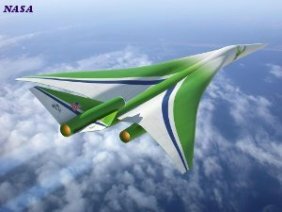 Contributing to creating a Good World. 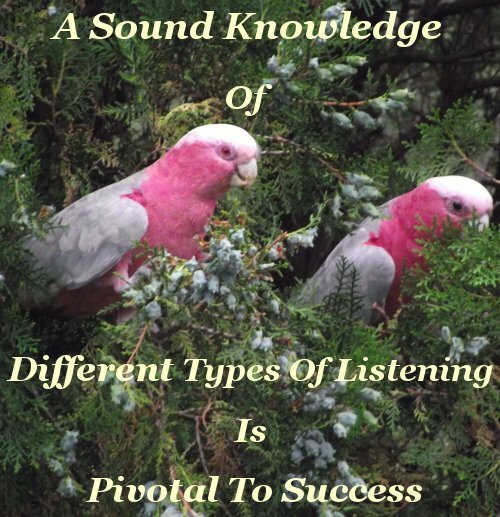 In common with the fundamentals of listening, the different types of listening are all of equal importance. Perhaps though, with the caveat that effective listening should be our ultimate goal for the simple reason effective listening embraces all the listening types, and delivers solutions to problems. Big or small. Again, practice makes perfect. By mastering the familiar, we encourage ourselves to experiment and become adept with the less familiar. Let’s begin with a listening type that challenges us incessantly . . . The first is how much does the listener care about the speaker. The second is how much does the listener care about what the speaker cares about. The closer the relationship the more important these two elements become. The more a listener cares, the stronger the bond the speaker feels. Conversely, the less the listener cares, the more distant and shallow a relationship becomes. Empathetic listening plays an important part in relationships and can be felt by the speaker from the listener’s body language and tone of voice perhaps more than by what the listener says. 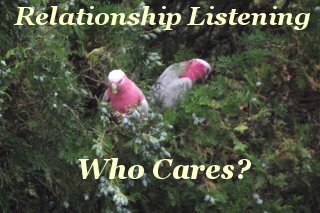 Relationship listening calls for support, to share good times as well as not so good. If the other person is important to you, one must be there for them. Unconditionally accepting the person whether or not the subject matter is agreeable. Habitually being “too busy” to listen to another person is a relationship killer. Ditto feeling entitled to ignore him or her. 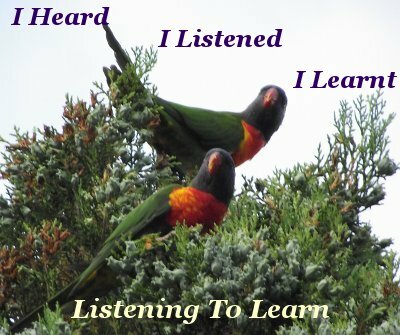 Listening to learn is a key method Humans use to acquire knowledge and information. And to expand their minds. whatever the context or situation, when we listen we have the opportunity to learn. the opposite is also true, refusal to listen can carry dire consequences. Focus and concentration are central to learning by listening. This is easy when one is familiar with and interested in the subject under discussion. Conversely one can get bogged down and lose track of what is being said if one’s vocabulary does not match the subject. Or we simply lose focus. The demand on one’s concentration can be considerable when listening to learn, particularly over extended periods of time. The abilities to comprehend and retain knowledge also play pivotal roles. These two normally come about with repetition. Jim Rohn, a wonderfully inspirational motivation speaker, was fond of saying that while his audience usually only heard his talk once, he got to hear it many times, enabling him to understand his own message better. Napoleon Hill urged his readers to teach others what they comprehend, for the same reason. We know how important repetition is to remembering and subsequent learning and understanding, and is an excellent reason to never be afraid to ask questions. We can take advantage of our ability to learn by listening wherever we may be and with whoever we may be with. Knowledge is not a burden to carry. Lack of knowledge though, can be a distinct disadvantage. Once mastered, listening to learn is a powerful tool indeed, effortlessly obviating a common burden. In just another irony of life, even though we usually don’t master discriminative listening without considerable experience, in effective communication, it comes into play first. Recognizing and identifying obscure nuances, indiscernible to, and therefore unnoticed by the less attentive, goes to the crux of effective communication. A discriminative listener is first and foremost a truth seeker, whose ability to discern exposes messages of a covert or cryptic nature, weeding out obfuscation and deceit. Empathetic listening allows a discriminative listener to judge without condemning. Time and patience will always reveal the truth. Mindfully practicing the various types of listening helps us to be discriminative listeners. Different Types Of Listening Rock!